I’d love to get feedback on the Wrigley’s Field of Dreams, if any of them mix that up. 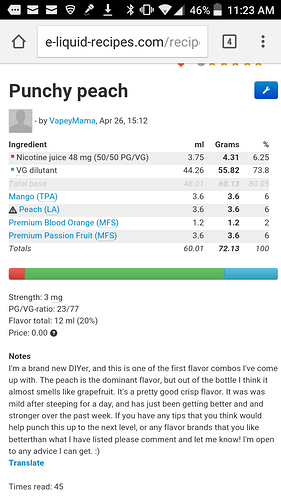 I made it at the above percentages, 50/50 base, and it was quite tasty out of my Kayfun at 15 watts, with moderate flavor intensity. This is the best three flavor mix I have and one of the few mixes I don’t seem to get tired of. I came up with an easy four ingredient mix that I named Punchy Peach that my husband and I are REALLY enjoying. Thanks for the add @authormichellehughes nice bunch over there so far ! Easier than herding cats. eh? Most of the recipes that i post are 2-5 flavorings. I keep the more complex mixes to myself as they are tailor made for my taste buds. My V2 of Sinnamon Cookie Kustard has 2.5% Cinnamon Danish Swirl. The SCK is delicious! Of course it should be with the three top flavors that Cap sells! I haven’t tried your V2 yet but I will. Many thanks, glad you like. V2 can be vaped a bit quicker and lets the Sugar Cookie come out a bit better. Hmm, now i need to go fill a tank with some. Is the cinnamon a little more tolerable at 2.5%. I love cinnamon but it tends to build up on my tongue. Here is another three flavor recipe that I am enjoying in my daily rotation.I realize not many have tried Gremlin Diy Vanilla Overload but I love it in this recipe and when making a vanilla custard. Dropped the CDS and upped the VC V1. That Butter Rum Candy is a winner!! http://tjek.nu/r/4rPf I’ma gonna try dis, looks good man. Good deal , Please let me know your thoughts. Ow, I’ll need to go shopping but this coffee sounds delicious! ; I’ll be sure to rate it after I get to mix it up, thanks for sharing! Easy peesy & Tons of flavor and did I mention Yum !